Calligraphy is the art of writing that has different strokes, brushes and bursting with fine-art design writing. It is usually used for wedding invitations way back years ago, but recently more and more design elements are using calligraphic font style as part of their full-packed layout. Lamar Pen is a classic and stunning hand-writing calligraphy font style of Mirabeau Buonaparte Lamar. His stylish and elegant hand writing results to a remarkable calligraphic font that looks awesome when letters are combined with one another. Dom Loves Mary is a tribute to the Debi Sementelli’s in-laws namely Dom and his wife Mary as a font symbol of beautiful life together. This calligraphic font is created to give your design a complimentary approach of both style and uniqueness. Hummingbird is an old-fashioned but stylish calligraphic font with many cursive details and stylish scripts. The uniformity of this font style looks disciplined and very attractive when put all together. The variation of letters is also very elegant that can complement to any design layout. Aphrodite Slim Pro is under the calligraphic font family of Aphrodite Pro but with more detailed characters. This calligraphy font has over 1,000 glyphs and the swashes are very stylish with many curves and flourishes created by Maximiliano Sproviero and Sabrina Mariela Lopez. Scriptina Pro is upgraded by Fredrick Nader and Roger S. Nelsson published under CheapProFonts, as their 100th font released. This calligraphic font has numerous available alternates that are all beautifully design to fit with any design layout. 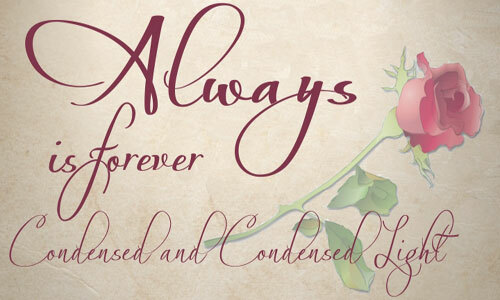 Edwardian Script ITC is a stylish calligraphic font with lots of flourish and cursive details. It has a very sophisticated letterforms and characters that look like a result of pointed steel pen. This can be a perfect font for your wedding invitations or to other event invitations. Perfumerie Script Pro is beautifully designed by Sabrina Lopez that has many stylish and classical calligraphic details. It has 2,500 available glyphs and font style is based on the author’s own calligraphy which makes it unique than other calligraphic font styles. Hiatus is a warmer approach for formal and classical scripts that lets you create the most unique combinations of letterforms with enough letter spacing in both capital and small letters. This calligraphic font will be the best font style for whatever type of occasion. Corinthia Pro is a simple but very attractive calligraphic font. It has beautiful cursive details designed by Colin Brignall. This font is inspired from Gill Sans and Railway Type which looks cleaner and beautifully design to soothe any calligraphic design layout. Monte Carlo is a traditional type of calligraphic fonts but offers many cursive details and swashes all in one font style. This beautiful script font is designed by Rob Leuschke with many flourishes and ornate that complements each other perfect font for wedding invitation. Always Pro font family is available in 6 different styles namely light condensed regular, condensed light, black, fat and regular. This calligraphic font is designed by Anton Scholtz and each font style is very stylish and with lots of curls and ornate. LD Wedding is a beautiful collection of letterforms inspired from Engraver’s Old English font. This calligraphic font is the lighter version of it and it is one of the most famous font styles for wedding invitations since 19th century. Bellissima Script Pro is inspired from the library of Alex Trochut’s grandfather created by Ramon Stirling in 1844. This beautiful calligraphic font is similar to other famous wedding fonts like Burgues and Conpendium but not from the same font family. Carolyna Pro Black is a bolder version of Carolyna Pro that looks very elegant and stylish. This calligraphic font is designed to give more emphasis on modern hand writing that can be read easily even on far view. It looks hand written but with lots of cursive details. Samantha Upright Pro is a very stylish calligraphic font style with lots of connected strokes, curls and beautiful flourishes. It has over 2,700 available glyphs to offer that can be perfect for wedding invitations and other event invitations. Poem Script Pro is one of the most stylish calligraphic font styles ever created. It has a very unique strokes and thin cursive details. This is the collection of American pen script style in 19th century and it is one of most used font for poems. PF Champion Script Pro is a beautiful font family that offers you variety of advanced details and stylish approach. It looks very powerful and beautiful letterfoms with uniformity that offers lots of curls on both capital and small letters. Quarzo is a flexible and stylish calligraphic font with detailed rounded angles. This font has a very consistent stroke with generous spacing that looks beautiful when it is printed, this can be a perfect font for wedding invitations and alike events. French Kiss is entirely different from most of the calligraphic fonts since it has broader strokes and separated letters. It doesn’t have much cursive details and flourishes but it still look classical and beautiful font perfect for event invitations.